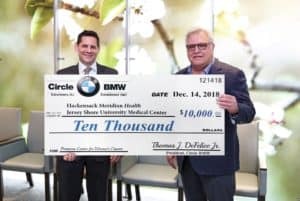 EATONTOWN, N.J. (January 9, 2019) – Circle BMW, the region’s premier BMW dealership, today announced they made a donation of $10,000 to the Perricone Center for Women’s Cancer at Hackensack Meridian Health Jersey Shore University Medical Center in Neptune, N.J. During the month of October, in conjunction with National Breast Cancer Awareness Month, Circle BMW pledged to sell a minimum of 100 cars and donate $100 per car. The goal was achieved and Circle BMW’s President, Tom DeFelice, presented a check to Kenneth N. Sable, M.D., MBA, FACEP, regional president, southern market, Hackensack Meridian Health, on December 14, 2018. The Perricone Center for Women’s Cancer is located in the new HOPE Tower, a state-of-the-art outpatient facility featuring leading experts in more than 15 specialties, an academic and research center to teach and pioneer lifesaving medical breakthroughs and a state-of-the-art cancer center with sophisticated technology all in a warm and welcoming environment that fosters healing and patient-centered care. “It was wonderful to see the staff at Circle BMW, and our customers, embrace this campaign and commit to raising funds that will benefit women’s breast cancer care for members of our local community. We are proud to make this donation and hope it positively impacts many patients,” explained DeFelice. To learn more about cancer services at HOPE Tower at Hackensack Meridian Health Jersey Shore University Medical Center, visit www.HackensackMeridianHealth.org/HOPE or to make a donation, contact Paul Huegel in the Jersey Shore University Medical Center Foundation at paul.huegel@hackensackmeridian.or or (732) 751-5117. The Jersey Shore University Medical Center Foundation welcomes contributions that support its mission, regardless of size, from any individual, family, business, corporation, foundation, or similar source. Circle BMW, owned and operated by Tom DeFelice since 1981, is dedicated to excellence in all phases of the BMW ownership experience: sales, service, parts, accessories, lifestyle products and lifetime customer support. Serving customers in Central New Jersey, Circle BMW is one of the tri-state area’s leading luxury automotive dealerships and a four-time recipient of the prestigious BMW Center of Excellence Award for achieving outstanding levels of performance and customer service. In addition to new vehicles, Circle BMW offers Certified Pre-Owned vehicles that meet demanding standards for resale. Our award-winning Service Department is among the top in the nation and is proud to employ the largest staff of BMW Master Technicians in New Jersey. Circle BMW is one of the largest BMW authorized stocking dealers of original equipment parts and accessories in the region. Learn more at circlebmw.com and connect with us on Facebook.com/CircleBMW, Twitter.com/circlebmwsales, Instagram/CircleBMW and YouTube.com/circlebmw. Hackensack Meridian Health Jersey Shore University Medical Center is a not-for-profit teaching hospital and the only Level II Trauma and Level II Pediatric Trauma Center in Monmouth and Ocean counties. It is home to K. Hovnanian Children’s Hospital, the first children’s hospital in Monmouth and Ocean counties. With more than 1,200 medical and dental staff in 60 specialty areas, Jersey Shore University Medical Center’s team provides quality care in a patient-centered, environmentally-friendly setting. The medical center is affiliated with Hackensack Meridian School of Medicine at Seton Hall University and St. George’s University School of Medicine. Jersey Shore University Medical Center recently completed the HOPE Tower Project – a $265 million 10-story medical office building that provides a new healing outpatient experience. Circle BMW President, Tom DeFelice (right), presented Kenneth N. Sable, (left) M.D., MBA, FACEP, regional president, southern market, Hackensack Meridian Health with a donation earmarked for the Perricone Center for Women’s Cancer at Hackensack Meridian Health Jersey Shore University Medical Center in Neptune.